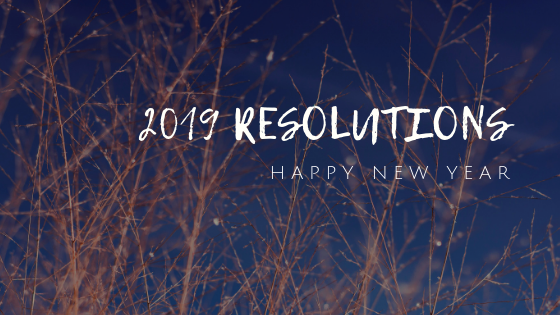 2019 Resolutions - Happy New Year! Honestly, how should I begin to write this post? Why am I sound so awkward lol Anyway, 2018 has been nothing but the best for me. Alhamdulillah. Of course, there are some bitter moments but there are tons of wonderful, cheerful, sweet and joyous moments happened in 2018. Those bitter moments I'm going to take it as a life lesson while beautiful moments I'm going to remember it always and do my best for this new year. Thank you, 2018 for those precious moments and I hope 2019 will be more wonderful things that in store for me and my family. p/s: This post should be posted in early January 2019 but somehow, I don't and today I decided to do it. So, 2019 resolutions. Yes, I do have a few on my minds so, here goes nothing. 📌 Positive thoughts. I want myself to always think positive no matter what situation I am in. I just do not want to be overthinking which leads me to think negatively. It is so important to taking care of your mental health. 📌 Express my gratitude. This is basically my last year resolutions so, I decided to always have this resolution every year just to ensure I'm doing it! I succeeded in thanking every people who have helped me when I'm in need, people working at retail stores, people who give me a way to me, my colleagues, to my family & friends - basically, anyone. Because when I'm expressing my gratitude, it feels so good and it means I appreciate it so much. It also makes me appreciate more with how I am and what I have. I always remember the feeling when someone said thank you to me when I worked at the retail store also at retail services. I miss working at the retail store, honestly. 📌 Saving & Earn Money for my own future. Well, there are long lists of what I want to buy also it is important to save your money for my own future. 📌 Spending my time more with my family. 📌 I'm planning to travel somewhere which I do not yet decide where in this year. 📌 To eat/drink more vitamins and calcium. The last time I was gained weight was back in 2014 which at 55kg. It's all because of the medicine that I need to be taken but then when I stop taking them, my weight drop to between 40kg to 44kg and this is my weight until now. I am underweight and that makes me worry also my parents worry about it as well. So, they bought me vitamins, make sure I drink milk (chocolate milk, please) and to drink the essence of chicken by Brands. 📌 Planning to read at least 3 non-fiction books. 📌 I'm thinking of joining a reading challenge organize by book bloggers/bookstagrammers which I have already one in my mind. What else? I think that's for now.